Barwon Heads Community Hall. Established 1922. This building constructed 1934. The Mechanics' Institute movement began in British urban industrial centres in the early 1800s. A "mechanic" was a person applying skills and technology. During the 19th century, most towns in Victoria established a Mechanics' Institute or Athenaeum with a library and meeting hall. Common objects were the "spread of useful knowledge" and provision for "rational recreation" in the community. The first hall was a galvanised iron structure transported from North Geelong in 1922. On 12 December 1932 it was destroyed by fire. 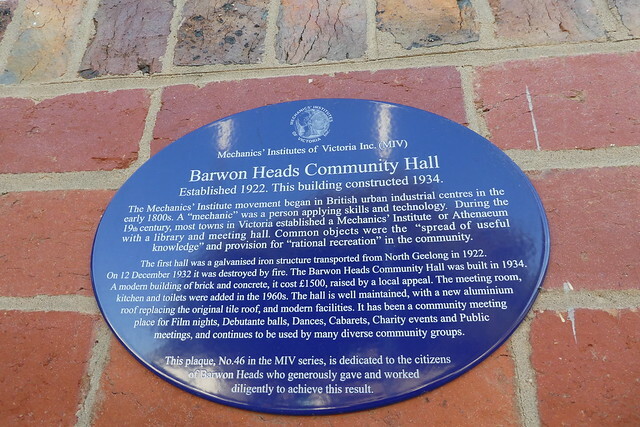 The Barwon Heads Community Hall was built in 1934. A modern building of brick and concrete, it cost 1500 pounds, raised by a local appeal. The meeting room, kitchen and toilets were added in the 1960s. The hall is well maintained, with a new aluminium roof replacing the original tile roof, and modern facilities. It has been a community meeting place for Film nights, Debutante balls, Dances, Cabarets, Charity events and Public meetings, and continues to be used by many diverse community groups. This plaque, No. 46 in the MIV series, is dedicated to this citizens of Barwon Heads who generously gave and worked diligently to achieve this result.